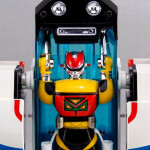 Tokunation › General Tokusatsu News › Godaikin Machineman & Machine Dolphin Gallery – Toku Toy Box Entry! 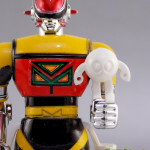 Godaikin Machineman & Machine Dolphin Gallery – Toku Toy Box Entry! 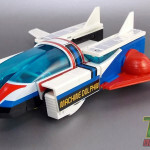 We’re kicking off our annual Toku Toy Box giveaway with a vintage blast from the past! 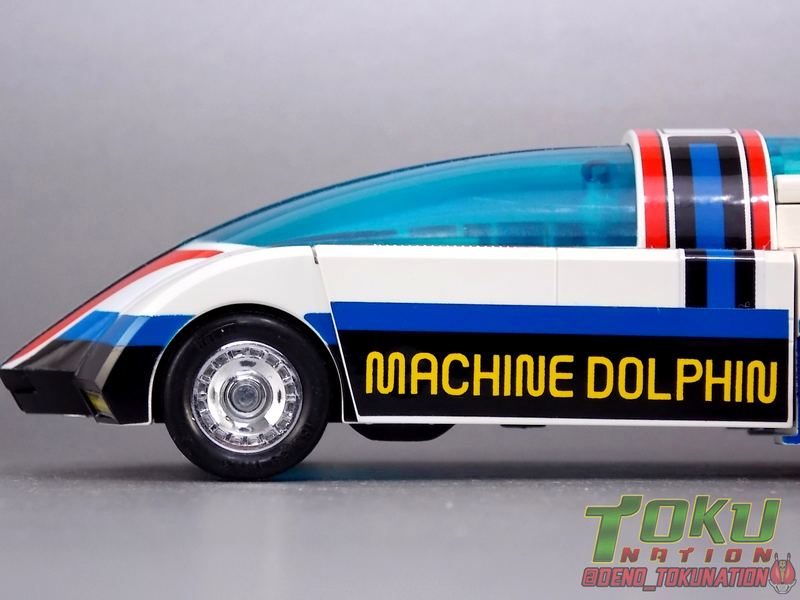 Released as a part of Bandai’s short lived American Godaikin toy line, today we take a look at the Machineman & Machine Dolphin set! 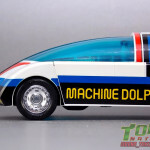 From the classic but often forgotten series Seiun Kamen Machineman, the Machine Dolphin vehicle can switch between 3 alternate modes. 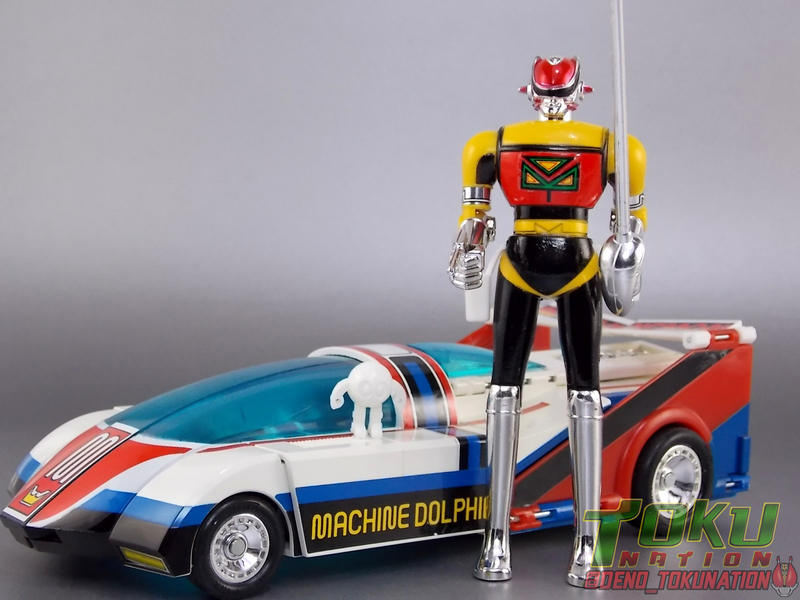 The standard Machine Dolphin supercar, Dolphin Jet, & the humanoid Dolphin Robo! 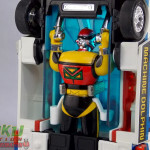 Machineman himself can ride along in any of these modes as well! 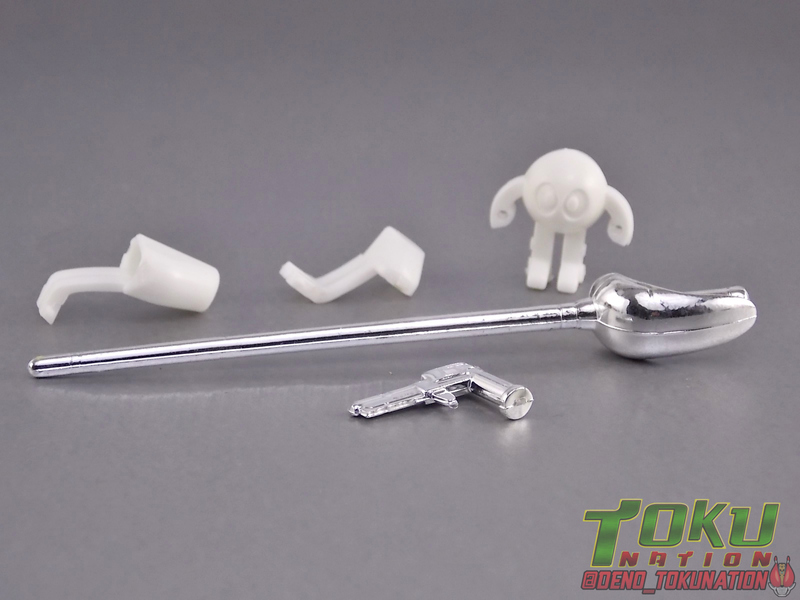 Machineman also comes packed with accessories like his Laser Saber & Throttle Gun, as well as his tiny sidekick Ball Boy! 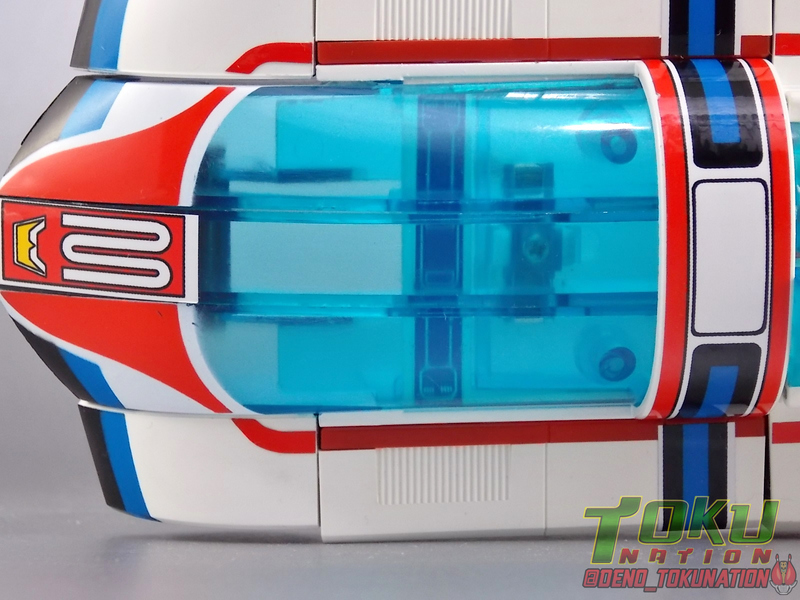 Both Machineman and this vehicle feature significant diecast content as well! 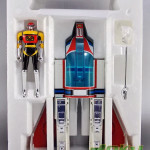 A true classic the Machine Dolphin set reminds us of how creative and unique Toku Toys could once be. If you have no experience with the Machineman series or character then have no fear! We’ve included a brief overview of both in the gallery below. 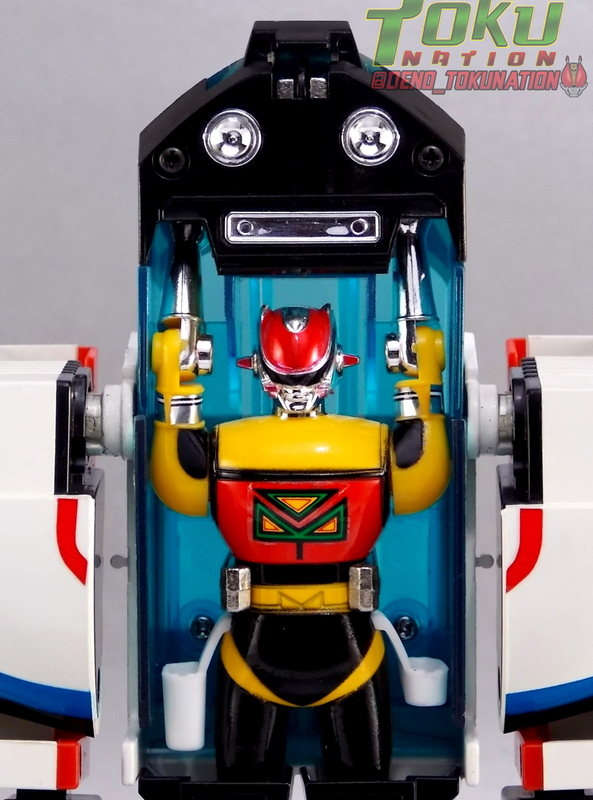 Feel free to browse more than 50 images of the Godaikin Machineman & Machine Dolphin as well asa full review by clicking “Discuss on the The TokuNation Forums” at the bottom of this post! 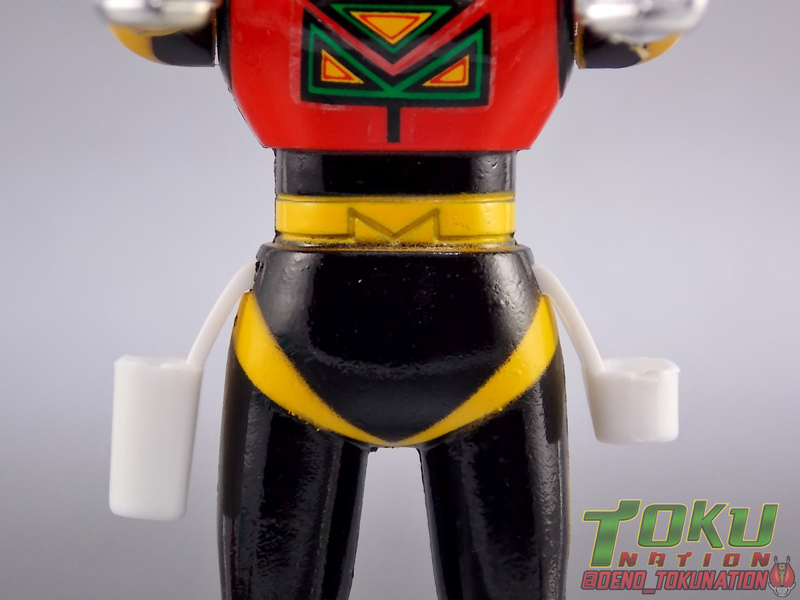 This one's gonna come from way out of left field for most of you, but a recent behind the scenes Dynaman video got me psyched to do this gallery. At the end of that video were some gorgeous shots pf physical props from a unique and often forgotten tokusatsu; Seiun Kamen Machineman! I've been sitting on this item for some time but wanted to share it at last. A vintage Godaikin Machineman & Machine Dolphin set! For a little background, Seiun Kamen Machineman was a series created by the late great Shotaro Ishinimori in 1984. The lead hero hails from the planet Ivy and has come to Earth to study humans for his doctoral thesis, taking on an alias as Ken Takase. Ken winds up staying on Earth much longer than he intended (36 episodes) when he discovers that the evil organization Tentacle, later Octopus, seeks to remove all children form the world. 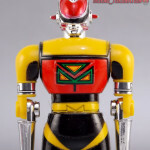 As a result he dons the technology of his home world and becomes Machineman! Machineman is a series that I, like many, have never actually gotten to watch. It's certainly not something your typical fansub groups would ever tackle, and raws aren't even something you can find normally. I've always been intrigued by the characters backstory and unique look though. So I'm happy to be able to share at least a piece of this series it with you. For additional context I've included some images from the series to illustrate a bit better some of my points. Having picked mine up some time ago, I'm afraid I don't actually have the outer box for my Godaikin Machine Dolphin. Only the styrofoam insert. That would be because technically, this is the original Japanese release. For those unaware, Godaikin was a short lived high end series of releases that came to America directly via Bandai Japan in the late 80's. These were literally the same toys released by Bandai domestically in Japan. They were even shipped to the states in their original Japanese packaging and repacked into the new Godaikin boxes stateside. So mine comes from a warehouse stock of samples that were never reboxed or circulated, hence it's near immaculate condition. 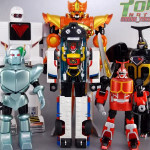 Godakin didn't last long here due to it's high price point for the time but it allowed many american collectors to experience for the first time the wonder of such amazing toys as Sun Vulcan Robo, Bio Robo, Daltaneous, Combattler V, Daitetsujin 17, and many more. Many of these release still fetch incredible prices today as well. Of the two primary components in this set, Machineman himself is the least impressive. 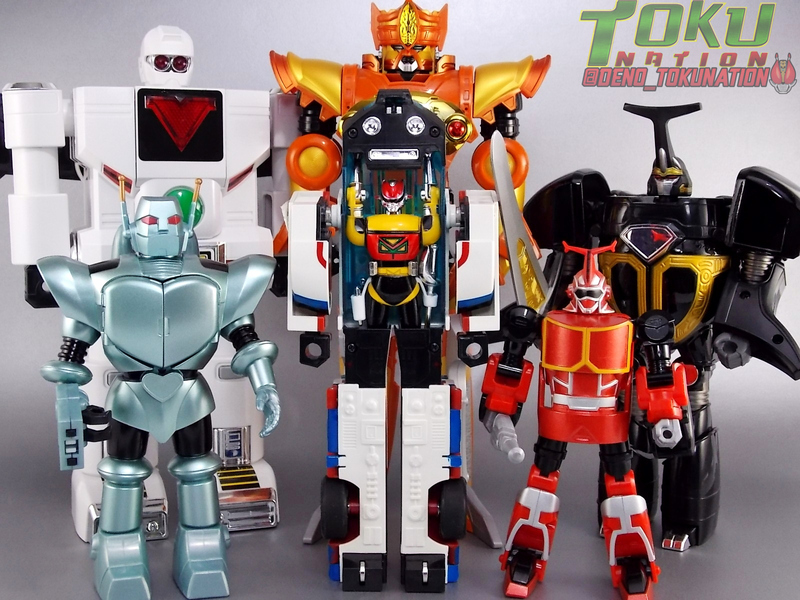 Now of course this set was released in 1984 in Japan so I can't be too critical of it after all. So I'll try to stick to the basics. Machineman is himself a hefty little Chogokin figure. 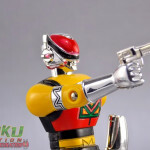 One of a similar style as those released for Super Sentai & Kamen Rider in the 80's & 90's. He's squat, bulky, and heavy with limited articulation that was excellent for the time. He has moving shoulders, elbows, and knees. 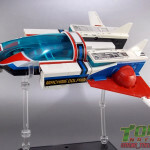 The neck joint can also collapse backwards to allow him to sit in more of a piloting position when in Machine Dolphin. This figure is quite small by today's standards but still manages to look pretty great thanks to a few decent paint apps and some well applied labels for detail. You won't get any dynamic poses out of him but for what it is this is a good figure. 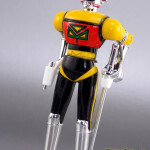 The only weird thing is that this figure doesn't feature Machineman's iconic clear cape. 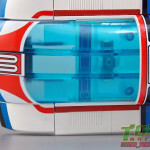 It's a very weird accessory in show, as it basically looks like a shower curtain, but the toy doesn't feature it at all. On the flip side though Machineman didn't always use it either. 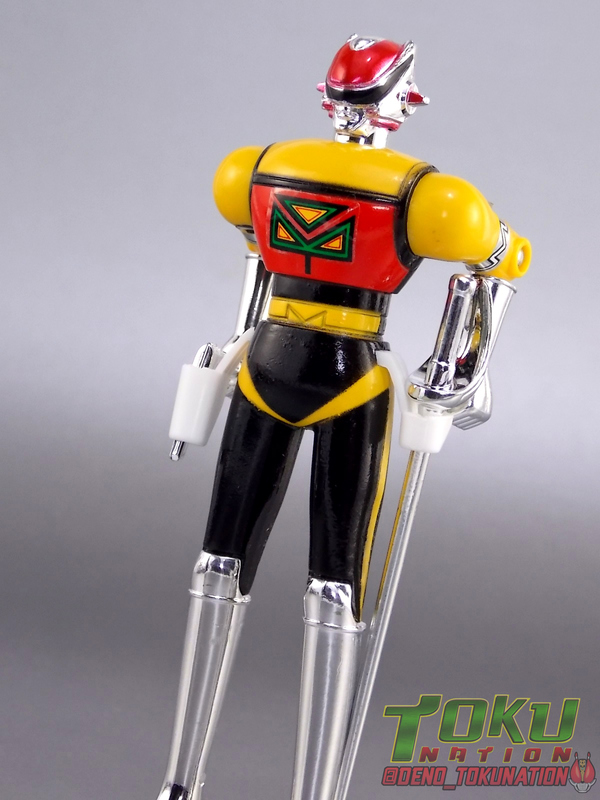 I'd kill for a figuart of Machineman with a nice clear hinged cape. Maybe one day. 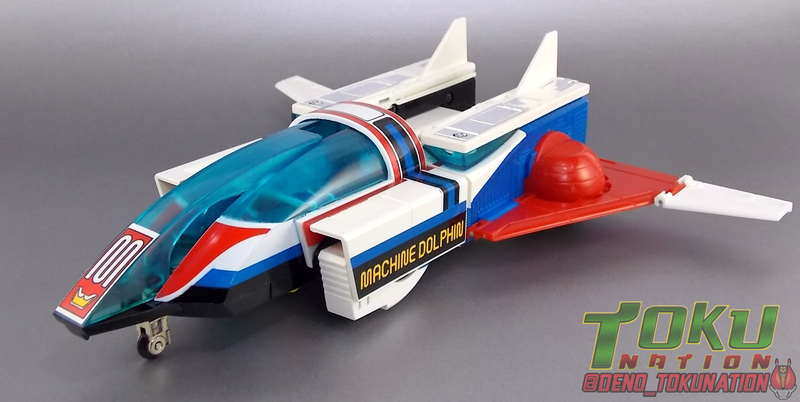 By far the best part of this set is the fully transformable Machine Dolphin! This vehicle is pretty damn close to a 1:1 scale with the figure included with it. 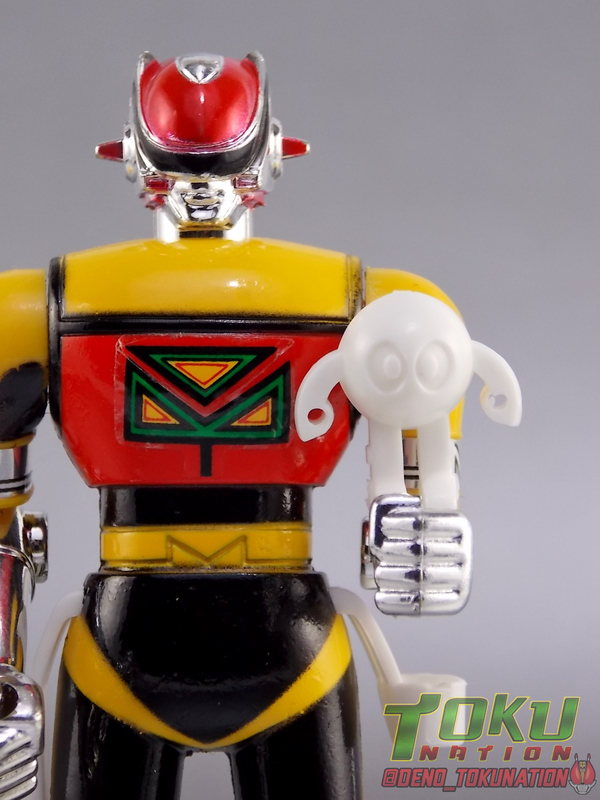 If Machineman were a bit larger or Dolphin a bit smaller it would be spot on. 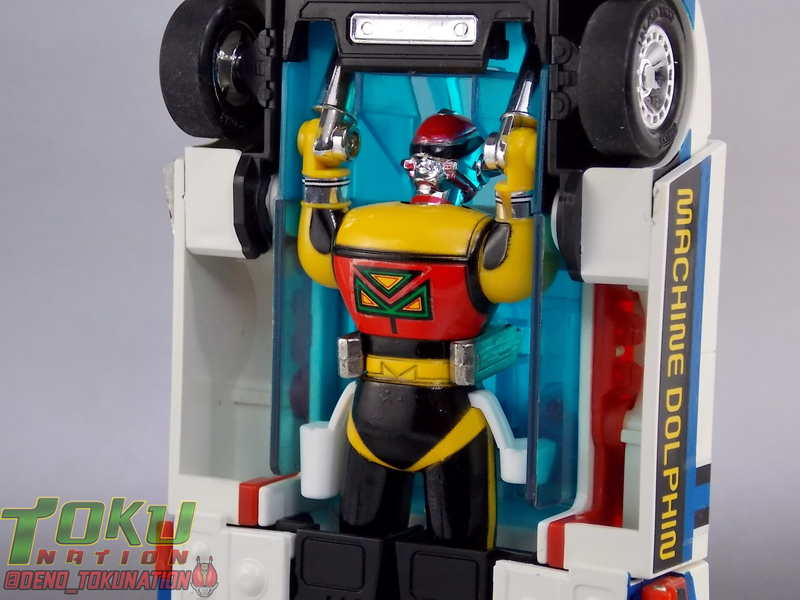 The Dolphin acts as an almost exo-suit/skeleton for Machineman so it's not much larger than he is, as can be seen when an actor rides in the vehicle. This is all really unique for a transforming tokusatsu mecha. Imagine a Machine Dolphin to scale with today's S.H. 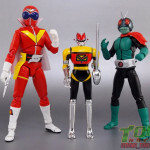 Figuarts line, that would be incredible. 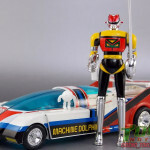 Machineman can ride in Machine Dolphin in all 3 of it's forms as well. Just insert him from the underside legs first with his neck joint rotated back, allowing him to stare through the windshield of the car. There's a very sturdy metal clasp to snap his waist into that will keep in there nice and securely. This figure is packaged in it's Jet mode, but for the sake of trasnformation ease we're beginning with the car form. 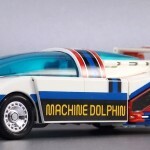 Machine Dolphin is the standard super future car mode for this piece. Hailing from an alien planet it is of course a bit different compared to most vehicles. It's not quite street legal looking but it's really unique. As a Godaikin/Chogokin this figure features some die cast metal to give it some good heft. The tires are also rubber adding another layer of authenticity to it. The labels are pre-applied from the factory as well so there's nothing to worry about there. Mine does have a defective peeling label but it's really not that bad. 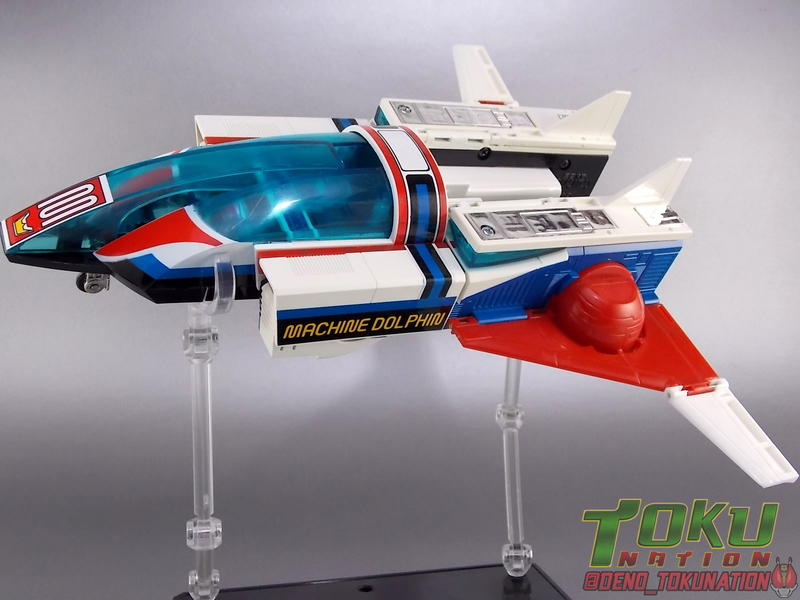 To get Dolphin into it's flight capable form, Dolphin Jet, you need to do a little bit of transforming. First fold the wings/spoiler section down and out, which rotates the rear wheels out of sight, you'll noticed sculpted in black thrusters with small metal wheels on the rear of the car. Fold these down and the wheels become a landing gear of sorts. The engine detailing on the rear end is also hinged on panels to fold up and out to the side revealing wing tips. Moving to the front end rotate the front fenders down and into the underside of the car, then extend the center of the cockpit forward revealing the forward landing gear. 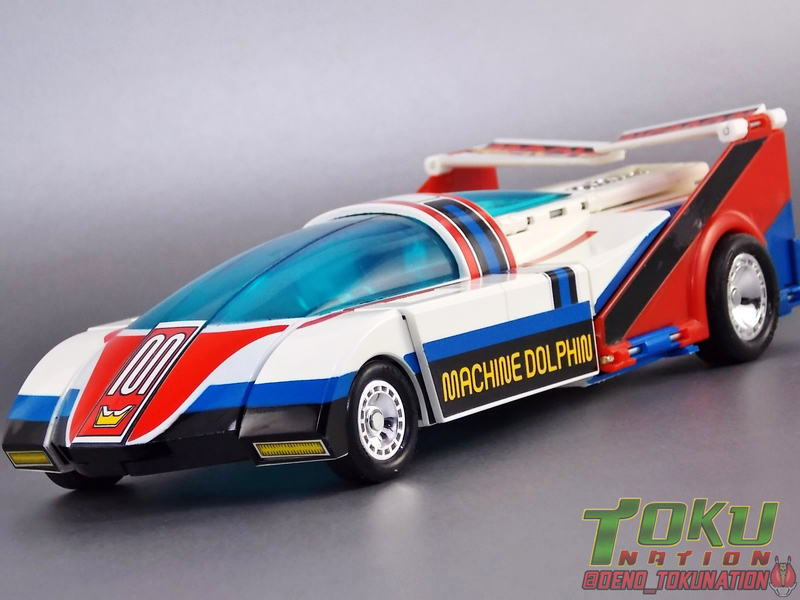 This finishes off the sleek and incredible looking Dolphin Jet! It really is a gorgeous piece in this form. Perhaps my favorite way to display it. The third and by far most bizarre form for this toy is Dolphin Robo! A bipedal robot with Machineman sitting in it's abdomen. After the Jet transformation you're basically half to this form already. The rear tailwing sections are on hinged joints that swing back and inward and lock in palce. This movement reveals the fists connected to the back of the side fender. Bring the wing you folded out earlier back in and straighten out the spoilers to become sort of gigantic heel spurs. The front half of each foot should already be folded out as they were for Jet Mode. No stand the main body upright and grab the shoulders, pulling outward. This unlocks them and allows them to spin 360 degrees, it also gives the Machine Dolphin a wider stance. Throughout all of these transformations Machineman can be left in, you just need to fold his head back down into standard position for this mode. And voila! Machine Dolphin stands tall! And has a terrifying chrome face. It's really bizarre and goofy looking but honestly not that weird for 1984. 1 - Ball Boy. A small solid white spherical figure with molded arms and legs. All in all a decent representation of Machineman's in show sidekick whom he would also use from time to time as an actual baseball to throw at enemies. Fun fact, Ball Boy was voiced by Machiko Soga, none other than Bandora from Kyoryu Sentai Zyuranger! 2 - hip holsters. Designed to hold Machineman's included weapons. 1 - Laser Saber. A fully chromed Rapier like weapon. With a name like that it's pretty clear inspiration was drawn from the Laser Blades of the Space Sheriffs. 1 - Throttle Gun. Another fully chromed weapon. Pretty plain but it get's the job done. Honestly for a set of it's age, this one comes with a lot. Some really good relevant to the character stuff. 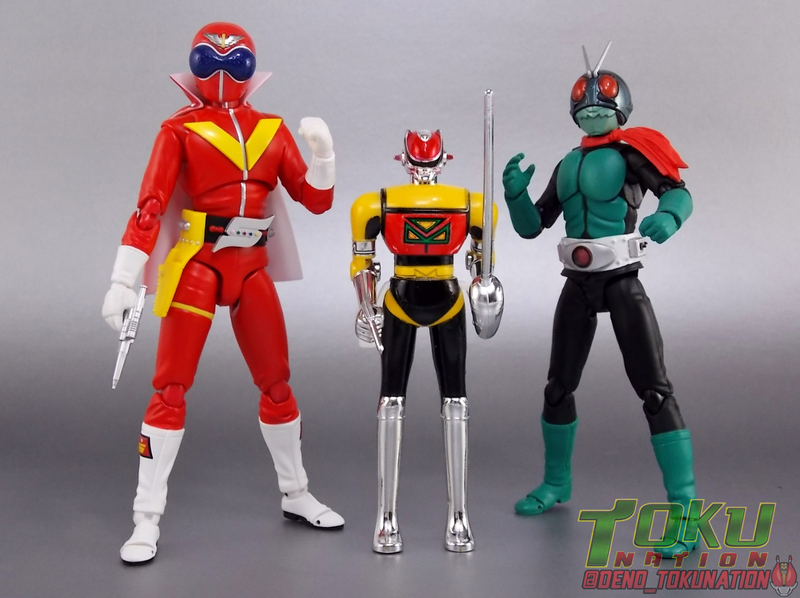 Again a cape would have been nice but very few if any Machineman figures came with a cape so it's not that weird. It's not often I get to take a look at vintage items that go quite this far back. But it's a rewarding experience when I do. The Godaikin Machineman & Machine Dolphin set is an absolute treat. Sturdy & creatively engineered this is just a fun toy. It's no wonder it still commands such high secondary market prices. 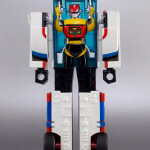 The show Seiun Kamen Machineman may have been short lived and forgotten but this toy in particular is excellent in just about every way (funky robot mode aside). 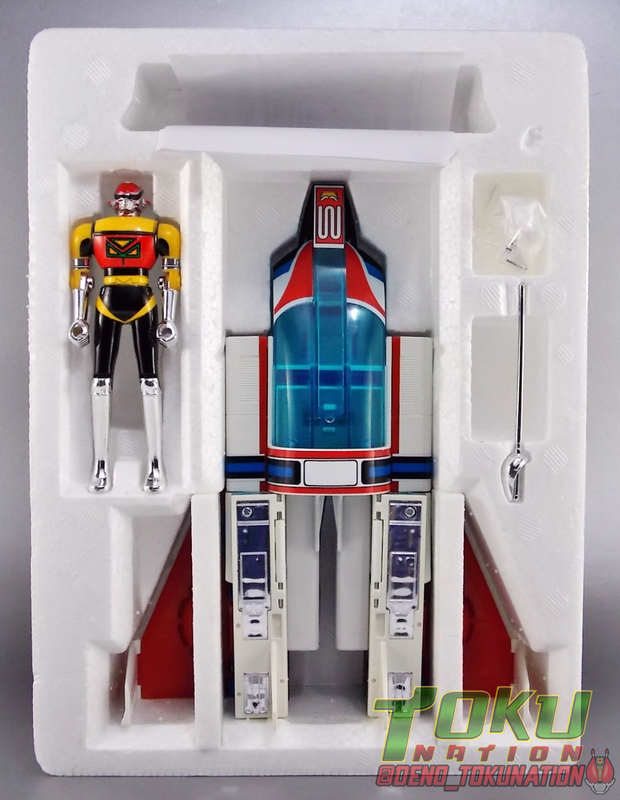 Can't say I recommend seeking it out based on the absurdly high prices the Godaikin release goes for, let alone the insanely high prices that the original DX/popynica release goes for. But should you ever find one at a reasonable price I'd highly suggest treating yourself to it. Additional shots rounding out transformations! 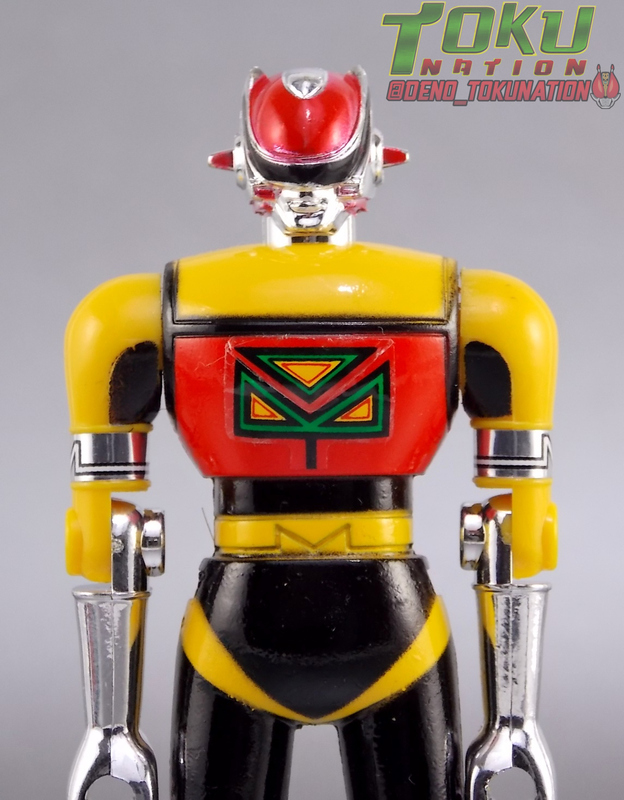 Thats one freaky toku hero and I'm surprised I havent heard of him until now. Looking pretty interesting though. Might need to hunt down the show. So the "robo" mode is basically an exosuit? 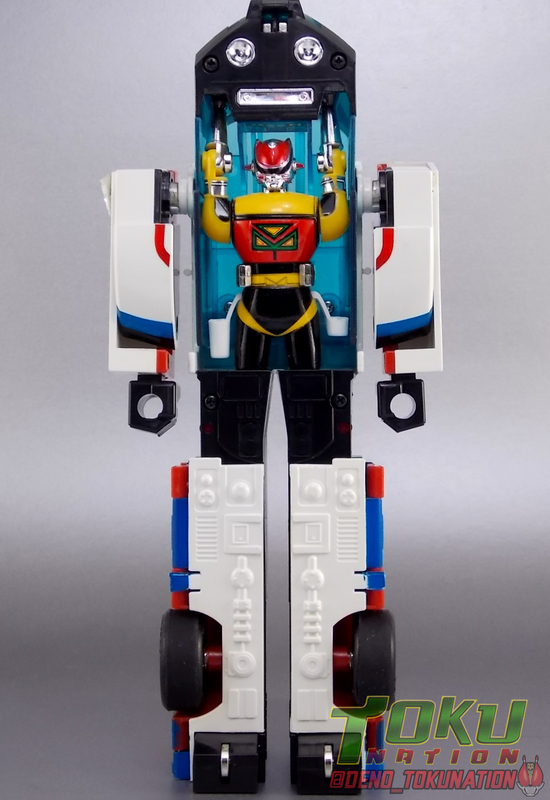 It'd be cool to see Sentai adapt something like this with exo-type mecha/zords whose final ultimate combination is a standard sized Megazord. That's a very unique take on a Toku hero design. 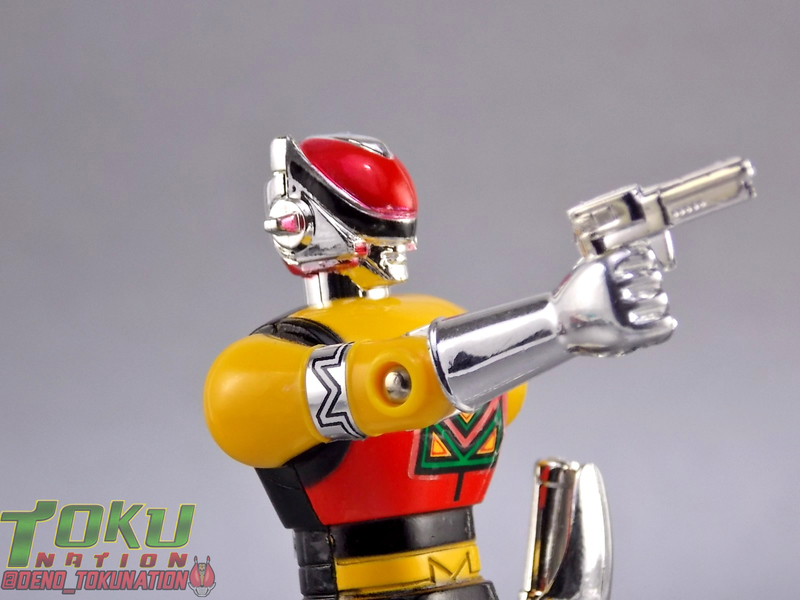 Maybe Toei will revisit some of the concepts in the future. Huh, I have never even heard of this guy. The suit design looks cool though and the figure reminds me of the old Beetleborg Figures that came with the bikes, except those had leg articulation. The Car and Jet modes look cool, the robot mode is a bit meh but for some reason it reminds me of Dexter's Dodgeball Exosuit and the Exosuit from Alien. That's a pretty niffy story on how these toys got onto American shores. A pity I didn't get into tokusatsu until MMPR as the Machine Dolphin just looks so cool! A car that transforms from a car to a jet to an exosuit? MD's almost the Power Diser's grandpa in that sense. Machineman is lacking as to be expecting but for the age he was made in and the age range they were going for he turned out a little better than I thought. Gorgeous piece. Surprised the chrome has heald up so well.